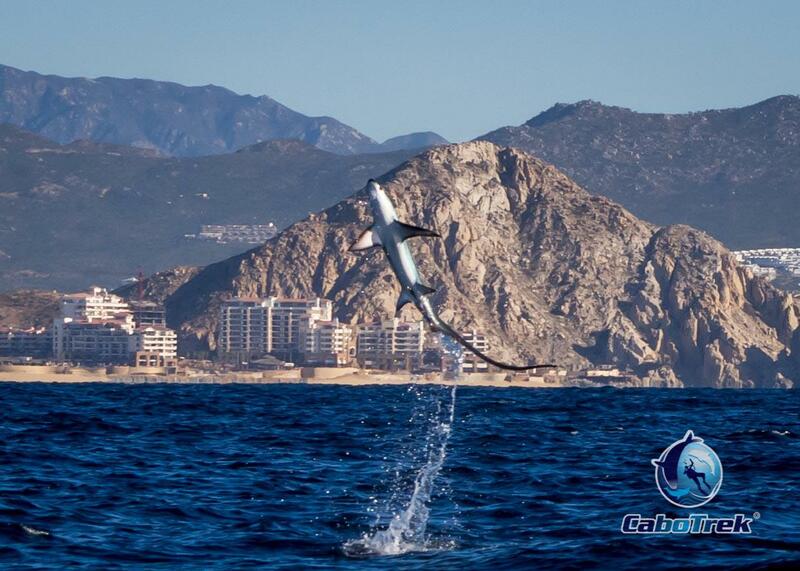 Every year, starting in late november, some of largest creatures to have ever lived make their way to the waters of Los Cabos. Humpback whales have been migrating to these waters for thousands of years before humans even lived in this part of Baja California. The northern pacific population of humpbacks is in such force December to April that we are able to guarantee whale sightings every single day of the whale watching season. But what we saw on this day, was so incredibly amazing and rare that every one of our guests were ecstatic. 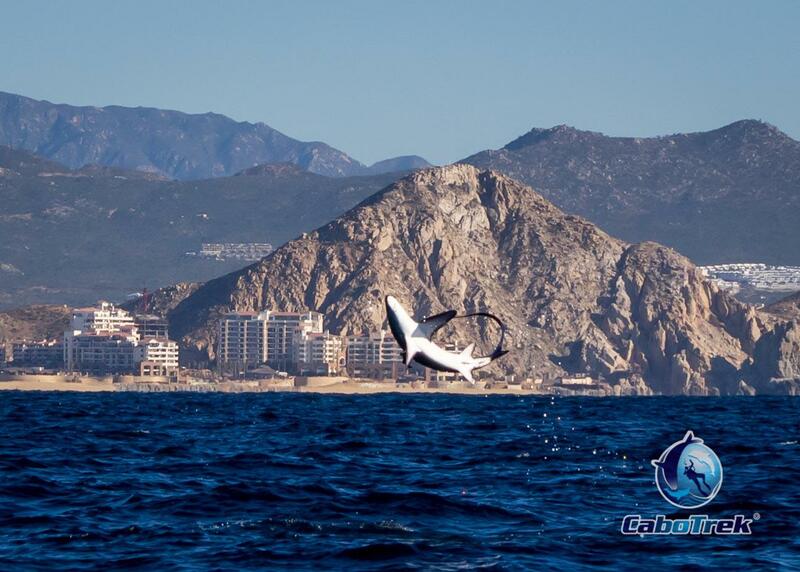 Our tour does not only cover the whales of Cabo San Lucas, but other wildlife throughout the area as well. We often see dolphins, sea lions, frigatebirds, pelicans, cormorants, breaching mobula mantas, striped marlins feeding, along with many other species of wildlife. 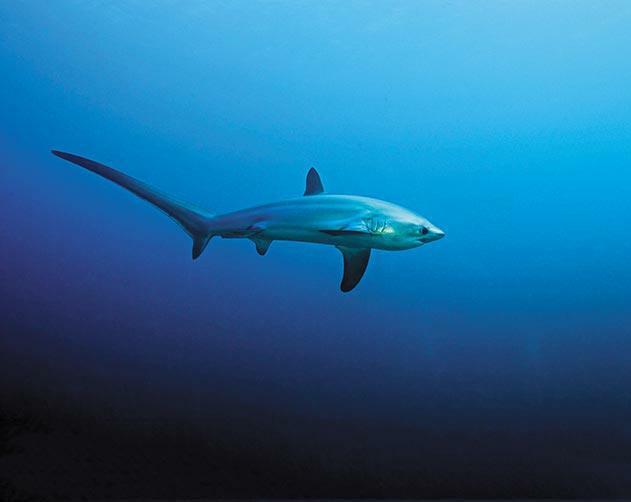 All of these sightings paled in comparison to what we were able to witness on this day, a breaching thresher shark! This day we headed out from the Arch of Cabo San Lucas to begin our whale watching excursion as normal, with all the guests relaxing in the shade while the captain and guide get to work finding some whales. We quickly spotted a group half a mile out from the arch and began heading in that direction. On the way out we spotted some mobula mantas breaching the surface of the water and even one marlin jumping across the surface as it was feeding. We found the group of humpbacks rather quickly and were able to see many of the more common whale behaviors, such as the blow, peduncle arch, fluke up, and fluke down. After about ten minutes with the humpbacks, the captain quickly brought our guides attention to the back of the boat, where a thresher shark was breaching out of the water, most likely feeding. This shark bre ached a total of 5 times out of the water right behind our boat, sometimes as high as 8 feet out of the water. The guests just watched in awe and Frankie, our biologist guide, snapped as many photos as possible before the action subsided. 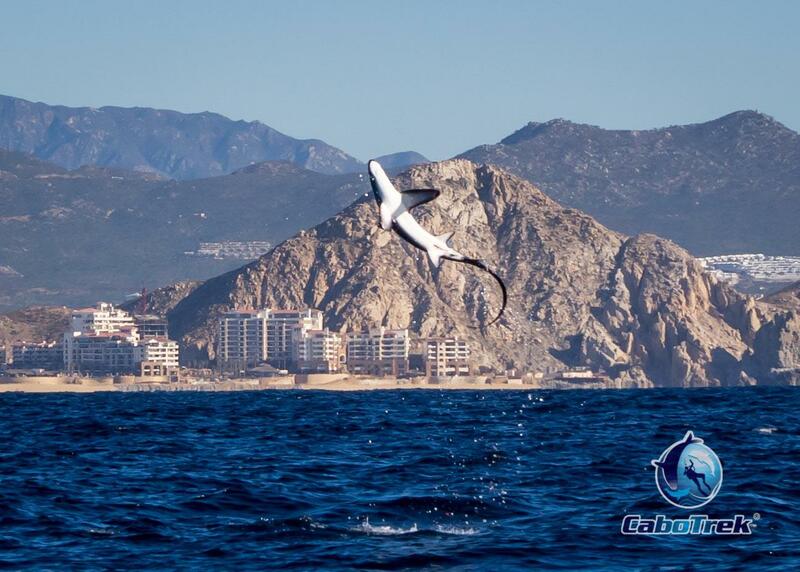 Our guide did not even know how special this encounter was until doing some further research with boat captains who have years of experience working in the waters of Los Cabos. We soon realized that this was quite a rare event to witness with our own eyes, and extraordinary to have photos of the event. This was definitely one of the most amazing wildlife encounters we have had here at Cabo Trek in Cabo San Lucas (Baja California Sur, Mexico), and we hope to continue the magic throughout the remainder of the whale watching season!